Not a whole ton is happened this week but the members here are really amazing. They do so much and help us so much. The Lord wants me to learn a lot more patience and humility right now with my new companion. I'm trying to read when I'm on the bus going from Bolivar to Olivarría and back and I'm reading in the fast way without really, really studying but just reading and pondering. Today I was in the Doctrine and Covenants section 18 and in verse 38 it says, "...and by their desires and their works you shall know them." This week in priesthood we have a returned missionary from Mendosa and he was an assistant and he was talking about obedience and when I was reading today I came across this scripture and it really hit me especially. In my first transfer out here I knew I had good desires, but some of my actions weren't reflecting some of those desires and so I have learned a lot since then and I still have an eternity to learn, but we always have to check to see if our desires are aligned with God's desires and also if our works and actions are aligned with our desires. Sorry this is so short but I am trying to fix my camera so hopefully the pictures will start coming again. Thank you all for you love and support. Have a great week. I don't have much time today and sorry, I don't have any pictures. I've been having a lot of problems with my camera. I would have thought that being out here would have been really weird just the fact that I'm not home and everything. The reason being on a mission isn't as weird as I thought it would be is something my Dad said from time to time and I've really tried to do out here. "Little by little everything is simple." As we do that, everything really is simpler. It still may not be easy, but it is always manageable for example, in 1 Corinthians, all of those temptations when viewed in bulk would seem impossible but when you take each little one individually, it is relatively easy. In 1 Nephi 3:7, the same thing and there is the classic one in Alma 37:6. It is by small and simple means always the great stuff happens. Start with the small and when you look back you'll find out you've done a lot. Happy San Martin Day! San Martin is the Gorge Washington of Argentina, Chile and maybe also Uruguay. Every major division street in Argentina is named after him or at least all of the cities I've been in. There might not be any pictures for awhile as my camera card broke and I need to get a new one. My sister asked for a funny story so I remembered this one I was really embarrassed about. There is this one time where my first companion was buying a pasta frola or kind of the closest thing they have to a pie down here. As he was buying it, I found out he was paying for it all with change, which of course is really rude! So I offer to pay with bills. Now keep in mind that this is my second week mas or menos. So I do that and after wards I ask my companion why he was trying to pay her in change! He answers that practically everyone down here wants more change and all of that so I felt really embarrassed! So that's a funny story. My new area is really big, well not really, but when compared with Rauch, its huge, maybe about 4-5 times the size. There is about the same amount of members so there is a lot of work to do. The missionaries before us didn't do much so the members have a lot for us to do which is fantastic. When we arrived the apartment was terrible so we went and cleaned and cleaned and then cleaned a little bit more. It was really bad. We also spent a lot of time trying to look for some maps of the area too. We have three; one from the church they made, one from the local government but really old, and one that we just found and all together they have it all, but separately they don't have very much so it is really difficult to find some stuff. There are a lot of changes happening in the mission and I'm really excited about it. This mission is kind of coming out of its dark ages you might say and now it's really going through some dramatic improvements. My district leader is 18. Apparently if you go to a church school you have the option of going on your mission early so he already has 9 months and he is still 18. I wish I could have left earlier but none the less I'm excited to be out here! I know this is the true church. I know Christ lives and he loves us. Have a great week! Hola from Olavarría! I got transfered to San Carlos de Bolivar or just Bolivar for short. It's about two hours from Olivarria which is the center of the zone. Which is another small zone too. Both Tandil and Olivarria have 10 missionaries each. This week was interesting. We decided that we weren't going to fall into the end of the transfer slump like almost all of the rest of the mission does so we set a really high goal and we were able to teach more lessons than any other week we've had this transfer. It just goes to show you when you set your goals high, you can do a lot more. Don't ever limit yourself by goals that are lower than your potential. How do we find out our potential, well set goals until you can't reach them then we leave it there and work until we can reach it, then continue the cycle. I'm really going to miss Elder Kenney and even though he is getting a bit trunky (thoughts back home) we worked and worked and worked. Rauch is probably going to have five or more baptisms this first half of the next transfer. I have a story about a real missionaries dream. We were agrigating which is just teaching the first lesson more or less and we weren't going to make our goal by the end of the week and this was Friday. We also had tons of return lessons Saturday so we decided to do 6 agrigations so we could reach our goal and we didn't have any more books of Mormon either. So we started working on the goal and got 5 and then transfer calls came and I find out that I have to pack. We were talking about that 5 agrigations is good and is probably more than anyone in the mission right now because apparently no one works the day of transfer calls, but we decided to agrigate one more to reach the goal. We finally find this one lady that listens and it is Elder Kenney's turn to start the teaching and he actually accidently trips her daughter as she is trying to get out the door and he was tripping over his words a lot too. About halfway through the lesson the radio comes on and Elder Kenney says (I still don't know why) that's kind of sounds like the voice of God. I'm thinking what are you thinking! Then he goes on and says no not really and trying to recover. Well the lesson goes on and I finished by giving her a Book of Mormon and we walk away laughing thinking that Elder Kenney was a little off his rocker and all of that. Well she wanted us to pass by the next day so we do and the first thing she says is I read the lectura (assignment if you will) you gave me and I also read a lot of the Book of Alma (I love the book of Alma!) We're thinking, wow, this is too good to be true. So then the both of us were thinking that maybe we ran into a less-active member, so we ask if she has been baptized and she says no. So we had huge smiles on our faces for the rest of the lesson. It was amazing! So now however I won't really be able to teach her being in Bolivar but it was an amazing experience and I'm glad I got to be a part of it. Her story is even more incredible, but I don't have any more time. Thank you for all of your prayers, I know that they are helping! This is the true and living church of God. I know that, and I'm so blessed to have that knowledge and this opportunity! 3 NEW PICTURES HAVE BEEN POSTED. I'm sorry as this will be a bit short but I don't have much time today. But I have an experience that is kind of funny. Elder Kenney and I are walking back to the appointment so we could go to Tandil to have interviews with the new president of the mission and as we were going we were talking about cualqier cosa (or just whatever) and all of the sudden we find ourselves in front of a door. So we knock it and while we're waiting for a response, I all of the sudden realized it wasn't me that led us up the stairs so I asked Elder Kenney if it was him that turned. He said no and I know I didn't, so as we're waiting we are saying that if someone answers, the Lord most definitely wants' us to find whoever it is that answers because we didn't go up to that door, we were guided there. Sure enough, a woman answers (looking very groggy I might add) and really great visit follows. What a wonderful spiritual experience! The Lord guides this work. I know I've said that before, but it is so true and I find out just how much everyday I'm out here serving. We also had this one investigator in church this week and it was fast and testimony meeting so as each member gets up there they all are talking almost directly to him about how their first time in church was hard and they had a lot of questions and all of this stuff about their first experiences with the church. Each one of them spoke of how the gospel has blessed their lives. 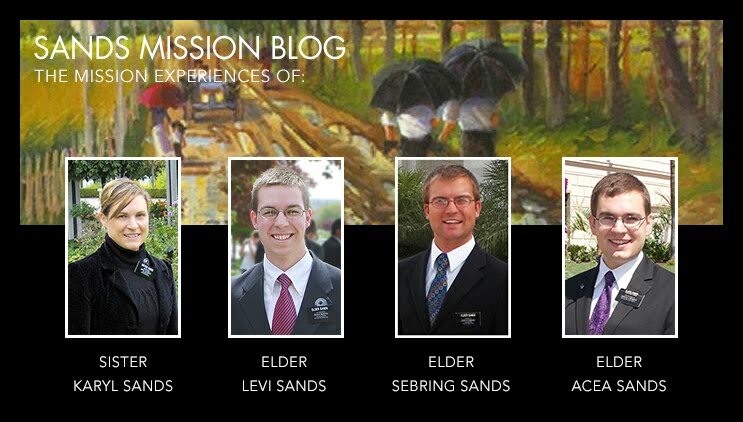 It was amazing as a missionary. I was so grateful for such a great branch. The investigator and his girlfriend (who is less active) said after when I asked them how it was, that it was incredible! I know this church is true, thank you all again for you love and support.